the heavens opened again (at least we weren’t camping this time)! For a short while this afternoon most of my front yard was under about 10cm of water…it did eventually sink in. Thankful that this week is almost over. I thought that I was going to have loads of time to get things done then remembered I had a trip to Craigieburn on Monday, Work Tuesday, Kids at their new school Wednesday plus the tiles pick up, work thursday and helping with the school fun day on Friday followed by Swim lessons for the boys after school. Kids were due to go to Dads on Friday but he has plans Friday evening so he is picking them up Saturday morning instead. I am thankful that we have always managed to maintain flexible arrangements for the kids – makes life easier for us both. He is having them later in December so that I can go to a concert and again so I can go to my work xmas dinner. I survived the kinder AGM without being elected into any exec position. I did get a fright when I went to check on the boys outside and stepped back in just in time to hear ‘Jude President’ but apparently she was just saying that Jude had been president in the past! I did make it clear that with working 2 days a week just being on the committee was enough. I want to test the waters gently as some committees are better than others, I like to help and be involved but not at the cost of my sanity! And for anyone interested I have some SU stamps for sale on my exdemo blog at http://www.heyjudestamps.wordpress.com so check it out for some great bargains. I know that some of you are wondering about my reasons for no longer being an SU! demo so here it is. I will make just this one post about the matter then let it drop. I have been a demo for just a few days shy of 3 years now and in that time I have done quite well for someone who is really little more than a hobby demo. I haven’t done a lot of classes and workshops, my stamp clubs kept me going and I never had a problem meeting the minimums. I love the product and I made some money and I had a lot of fun. It’s easy to sell a product you love. In my eyes SU! quit on me not the other way around. I signed an independent demo agreement when I became a demo and as of today if I refuse to sign the new agreement I am no longer a demo. Many people have no problems with the new agreement…many people (like me) do have issues. I said when I signed up that I wouldn’t let SU! take over my life. It was to be a part of my life, a part of my stamping and scrapbooking, never all of it…I needed a balance. The new agreement destroys that balance as it means that I am not allowed to say by name or link to any stamping or scrapbooking product that is not SU! I find this WAY too restrictive a policy for me to sign. There are people all over the world laying their lives on the line to fight for freedom of speech. We are lucky in this country to have that freedom and in fact I think many people are so used to it that they don’t realise just how precious it is. I had no problem with only mentioning SU! product on my SU! blog…but when they specifically laid down restrictions of what I could say and link to on my PERSONAL blog and on my FACEBOOK page ……well that is going too far. The saying goes that when God closes a door he opens a window….I will keep my eyes out for the window…perhaps it is just to really enjoy my scrapping freedom again. I rumaged in my room yesterday and rediscovered some clear stamps and my Xyron 250…and I have my new found love for RANGER STICKLES and am looking forward to getting out my big shot again with all my cuttlebug embossing folders. I will continue to use SU! products as I have a lot of them and love them still. I will miss it and I do hope that the many friends I have made through SU! will remain friends. I respect that everyone has had to make their own decision on this issue and have nothing against those that signed the new agreement…to each his/her own I say. So that’s it….I placed my last order yesterday. I will miss it. But I will find something else to do with my time I am sure – perhaps my scrap room will finally get organised, perhaps I will continue to scrap in a huge mess and enjoy the create chaos….who knows….life is an adventure after all. The list is big this year. Apparently they are going to try to align our catalogue more closely to that of the US which should mean exciting things to come on 1st April! For now though, take a look at the list and get your orders in quickly as some things will sell out quickly and will be gone forever. Also note that inkpads will be going up $2 to $11.95 and refills up $1 to $5.95 so if you were planning a major ink purchase now is the time to do it. AND some of the things in the list have been discounted so there is an extra bonus! Well guys just a few days to go til you can get your hands on a new mini catalague. 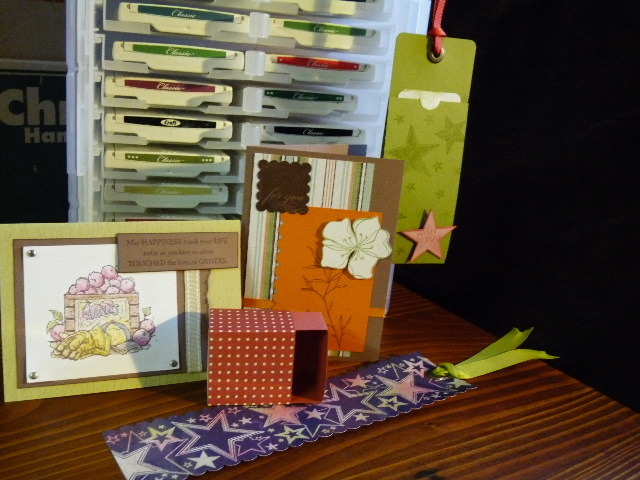 two cards, a bookmark, a little matchbox and a hanging tag. See the picture below for samples. You will get to use nearly all the new products from the new mini catalogue including the cool new scallop edge and scallop square punches. Guess what SU has put out a fabulous mini catalogue and I have lashed out and pre-ordered way too much of it so to celebrate you are all invited to a little launch party on Saturday the 29th November at 1pm in Caroline Springs (Victoria). The cost will be $15 per person and will include 5 small make and takes as well as afternoon tea and a copy of the mini. Please email me if you wish to book a place. Orders can be placed for new items on the day but the order won’t be lodged until at least the 1st December when the mini officially launches. So if you would like to be one of the first to play with the new scallop punches and awesome new stamps then drop me a line. Do to unforseen circumstances some people have been unable to make it to tonights class but there may be a repeat arranged in the near future for those that couldn’t make it. I have everything packed up ready to go and am really looking forward to it – it promises to be lots of fun and everyone should walk away with a completed mini album!